Have Reports On Gabrielle Giffords Been Too Optimistic? For months since the Arizona shooting, we've heard new details about Gabrielle Giffords that seems to suggest she's making an incredible recovery. While it's true that Giffords has been making great progress, a Newsweek feature suggests her abilities may have been exaggerated in the media. It's a miracle that Giffords even survived the attack, and it's understandable that the press and the public would be hungry for any encouraging news on her condition. But while speaking with Newsweek, doctors, friends, and family members stressed that the fantasy of Giffords running for Congress soon is probably unrealistic. Earlier, we learned that for months Democrats have been mulling the idea of Giffords making a run for Jon Kyl's empty Senate seat in 2012. She had already filed as a candidate, and the possibility that she could run has been floated by her staffers and colleagues. Many seem enthused by the political clout she has in Arizona and the rest of the nation, but even if a Congresswoman wounded on the job is essentially unbeatable, the fact remains that it's very unlikely that Giffords will be able to campaign as early as next year. There may be ways around this — Arizona Democrat Rodney Glassman has suggested that he could run in Giffords' place and turn over the seat as soon as she's recovered — but at this point Giffords isn't even aware that she's a candidate. Nor does she know the details about what happened to her. 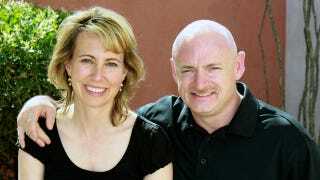 Her husband Mark Kelly decided to tell her that she had been shot when she noticed that he was skipping over some items while reading aloud from the New York Times and grabbed the paper from him. Giffords has a hard time believing that she's an international news story, and still hasn't been told that her friend Judge John Roll, staffer Gabe Zimmerman, and 9-year-old Christina Taylor Green were killed in the shooting. Michael McNulty, Giffords close friend and the chairman of her last campaign, said that the tone of some reports on Giffords health may be due to wishful thinking on the part of her loved ones. "It does seem to me, trying to be objective, that the reports of her recovery are so cheery and optimistic that people are going to have this expectation that it won't be another 18 months before they see her," he says. "They're going to want Gabby to show up in front of the cameras sometime. I don't know when that is." Mark Kelly told Newsweek that while he's hopeful that Giffords will be able to attend his space launch on April 29, the trip still hasn't been approved by doctors. Even if she does attend, she'll be kept behind a privacy wall, away from cameras. First and foremost, the nonspecialist should understand that when Kim and the other doctors on the team speak of progress, it is in relative terms, given that the patient has suffered severe brain damage. "‘Leaps and bounds' means much faster recovery than the average patient from a similar type of thing," Kim says. When he says that he is having conversations with Giffords, he means that he has asked her a question ("How are you today?") and that she has answered ("I'm better"). Kim adds that there is a bottom line for all such patients, whatever their recovery curve. "If somebody has a severe brain injury, are they ever going to be like they were before? The answer is no. They are never going to be the exact same person." Good news about Giffords recovery is still worth celebrating, but like those close to her, the public may need to adjust to the idea that her recovery will be a long and difficult process. While her improvements are heartening, it's too soon to be plotting her return to the political arena.